Toyota robots, definitely not the first product you would link the car manufacturer with. Though it could easily end up being their most beneficial product by miles. Both Toyota and Honda have been working on addressing the growing concern for the elderly. An aging population coupled with low birth rates could become a large problem in time. This is mainly due to the amount of people needing care. Both companies are based in Japan and have been focusing their development of humanoid robots that have good dexterity and control. We are focusing here on how Toyota got to this point in robotics and their trials so far. ‘Mobility for All’, this is the key driving force and ideal behind Toyota’s push into robotics. 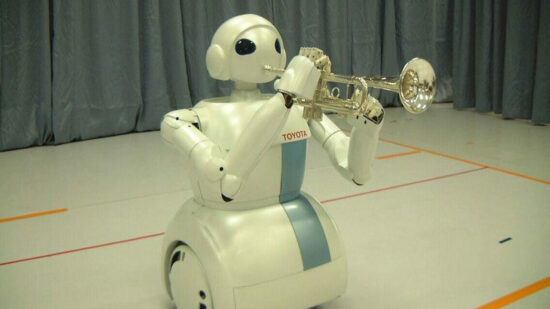 The image below is one of the earlier functional robots designed by Toyota back in 2004. The device originally amazed the public with its trumpet skills. Back on Earth after a successful voyage Toyota continue to develop Kirobo. Kirobo goes on sale to the general public. Toyota start a $100 million fund investing in startups and new robotics tech. HSR (Human Support Robot) by Toyota begins to improve peoples lives. The restructure of Toyota’s Partner Robot division aiming for speedy decision-making and hoping to shorten development time. 5G trials were also conducted this year between control centre and robot. The signals were sent from 10km away. Both transmitter and receiver were in 5G zones and the robot was given instructions that went through successfully. In their commitment to enriching lives, if the last ten years are anything to go by, Toyota do not seem to be running out of steam. A safe, tested machine that is capable of helping the elderly will be a boon to an ever changing world. Gadgethelpline are watching with interest as Toyota continue to develop their impressive robot line. All images sourced from Toyota Motor Corp.